Over the last 30 years, while manufacturing has experienced significant improvements through robotics and automation, the factory’s back office and procurement teams have been left behind. Even after billions have been invested in ERP systems over the last two decades, the primary mode of analysis and reporting is still spreadsheets. When problems occur, communication is handled through email, phone calls, and whiteboards scattered throughout the operation. Processes have become more streamlined and organizations more unified. Despite these advancements, many supply chain professionals continue to find themselves mired in slow, labor-intensive spreadsheet tasks in order to manage a complex system. This leaves decision-makers searching for ways to increase efficiency as well as visibility across multiple manufacturing sites and ERP systems. While many manufacturing companies are beginning to see the potential benefits of artificial intelligence (AI) within a digital transformation strategy, LeanDNA is unique in its ability to monitor and engage with factories anywhere in the world using common best-practice dashboards that are specifically built to drive savings through inventory optimization and improved on-time delivery. Everyone from CEOs to supply chain teams in the factory rely on LeanDNA to prioritize the top opportunities – and then help get them realized. Buyers and analysts can now shift from spending all their time collecting and reporting data to understanding the root causes of issues and driving the actions to get them solved. improved and automated, the real outcome is better results. For example, at Zodiac Aerospace, LeanDNA was initially implemented in pilot sites across three countries, each using their own ERP systems, including SAP and Infor. After three months, digital transformation at the factory reduced inventory by eight percent while improving on-time delivery from 70 percent to over 95 percent. You can learn more about their experience from their VP of Supply Chain directly here. LeanDNA was immediately expanded to additional sites resulting in similar results in each case. The executives are excited about the bottom-line results; the site leadership likes the visibility to easily manage the performance of their team and suppliers; buyers and supply chain analysts are happy with easier access to the information needed to do the best job. Companies worldwide have launched digital transformation. Traditional supply chain silos of operation are being challenged, opening new doors to greater opportunity for inventory reduction and innovation.Automation has already started to revolutionize supply chains across the world with forward-looking analytics that not only predict the future but recommend and trigger the best actions to improve the outcome. Those who don’t embrace the AI opportunity will be left behind as competitors use it to execute tasks, predict inventory disruptions, free up man-hours, and make work easier for their teams. 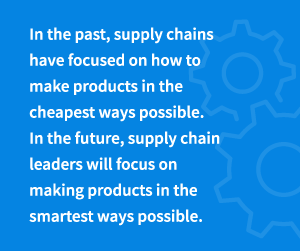 In the past, supply chains have focused on how to make products in the cheapest ways possible. In the future, supply chain leaders will focus on making products in the smartest ways possible. Many supply chain professionals associate automation with the manufacturing floor, but more and more are coming to recognize the value of utilizing AI to automate processes, analytics, and team collaboration. According to the Deloitte report, 57 percent of supply chain leaders surveyed believe that supply chain predictive analytics will create a competitive advantage within the next five years. This number is up from 38 percent in 2015. Like the transition from manual to automation on the factory floor, implementing AI-based data automation for supply chains requires new tools and visions for how work is completed. Supply chain organizations still performing manual analytics in spreadsheets or internally-developed solutions are at a disadvantage. Their processes are too slow and inefficient to be competitive, and there is too much opportunity for human error. These manual analytics are descriptive, only revealing intelligence about where the supply chain has been in the past. Historical results are important, but the emerging AI technology is focused on identifying ways to improve the future. Imagine an analytics platform smart enough to provide forward-looking intelligence that’s actionable immediately. Or an AI-based solution that adapts in real time to supply changes, automatically making adjustments to buying decisions based on advanced predictive analytics. Or imagine an analyst being provided with cross-site analytics that allows her to alleviate a shortage at one site by using excess inventory at another. These and many other benefits help create the competitive advantage an organization needs in the growing supply chain landscape. Speaking of the growing landscape, the manufacturing world makes room for new global players every single day. In this type of expanding field, a competitive edge is increasingly thin and difficult to gain. Supply chain professionals are aware of the challenge and responding. According to Deloitte, adoption of automation is predicted to jump from 37 to 71 percent over the next five years. Over the next five to ten years, the most competitive supply chain organizations will grow by 70 percent. As they do, watch for them to shift more and more to an insight-driven approach, utilizing AI and machine learning on both the factory floor and in decision-making. Spreadsheet analytics and reporting will no longer support the complex demands from customers with the added complexity of supply chains. It is vital that supply chain leaders utilize smart analytics as a core capability across their organizations – for everyone from buyers to line workers to executives. High-performing organizations are five times more likely to be more analytics-driven as compared to low-performing organizations which based decisions on intuition. Furthermore, high-performing organizations are twice as likely to use analytics for developing future strategies than are low-performing organizations. Supply chain leaders are not looking for more information; they’re looking for meaning from the information they already have. They no longer want to focus on the past, but rather focus on how to improve the future. The want to quickly identify the top opportunities, understand the root causes of problems, and quickly drive actions involving all relevant people in the organization. 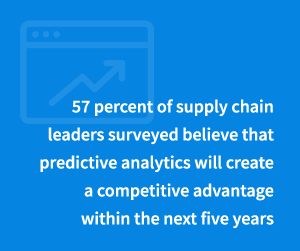 This is a key factor in gaining a competitive edge through supply chain predictive analytics. As the Deloitte study points out: Take a fresh look at all processes that will touch analytics and redesign them with an eye toward shortening the time between analysis and action. Are your current spreadsheets and ad-hoc reporting achieving the results you expect ? How long does it take analysts to determine the best next steps based on that information? Do your manual data processes leave open the possibility for significant human errors? Does everyone work following the same best practices ? Do they report data consistently across sites? This is where purpose-built AI-based prescriptive analytics offers a huge advantage. An advanced analytics platform automatically prioritizes those messages in visual dashboards, allowing analysts to immediately identify the top actions that will generate the most business value. Learn more about the Buyer’s Experience and how it can be transformed. It’s no secret that supply chains are utilizing AI-based automation on their factory floors, but it’s also apparent that those seeking to be on the cutting edge are employing similar platforms for data analytics. There is too much at stake to leave open the possibility for human error when advanced AI tools can eliminate those variables while providing more efficient, automated work. Accepting digital transformation for manufacturing means silos get broken down to deploy best-practice predictive analytics designed for supply chain across multiple sites and suppliers in weeks or days versus months or often years. With a focus on improving working capital efficiency and on-time delivery performance, manufacturers can utilize digital transformation to make smarter, faster, more profitable decisions every day. Just like on the factory floor, automated task completion leads to higher efficiency, fewer human errors and greater predictable outcomes. The time is now to adopt these principles and tools into your organization to take advantage of automation’s billion dollar edge.